Your host at Tower Rock Lodge: Michael Tuhy, Owner and Operator. Hailing from Portland, OR, Mike washed up on the shores of the Kenai thirty years ago, threw anchor... dried off... and hasn’t looked back since. Mike, with his identical evil-twin brother Mark, is proud to have raised the hospitality/culinary bar on the Kenai River to an uncompromising level. Hosting guests from all over the globe on unforgettable trips fly fishing, spin and whatever it takes (just short of a Dupont Spinner). Fly-fishing experience at Tower Rock Lodge: Alaska's TOWER ROCK LODGE features a five month fishing season. Our location in the heart of the Kenai Peninsula on the Kenai River presents a remarkable opportunity to visit a large number of Alaska's hot fishing spots during a single visit. Several are nearby while others are a short drive from the lodge or as close as a thirty minute floatplane flight. Our freshwater guides and saltwater skippers choose from over a dozen different salmon runs and resident fisheries during the course of the season. Each type of fishery has a specific time to consider. 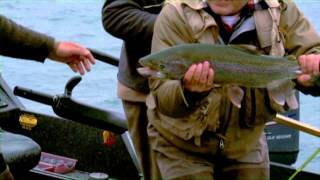 We primarily target king salmon, sockeye salmon, coho salmon, halibut and trout. Click here for quick link country guide. Tower Rock Lodge offers our guests a first class Alaskan experience with our four private log cabins. Click here to view the lodge. To select and book the top suggested hotels and accommodation in the area when fishing at Tower Rock Lodge, click here. car or public transport to Tower Rock Lodge.